When John Krasinski moonlights from “The Office” he doesn’t mess around. For the film “Promised Land,” Krasinski took on more than one side gig: not only does he act in it, he also concocted the story and screenplay with author Dave Eggers and co-star Matt Damon, and served as a producer. Centered on the environmental effects of fracking, a controversial means of extracting natural gas, “Promised Land” represents Krasinski’s latest bid to expand his Hollywood horizons as the “The Office” ends its final season. Krasinski sat down recently to talk about his new film and what the future holds. 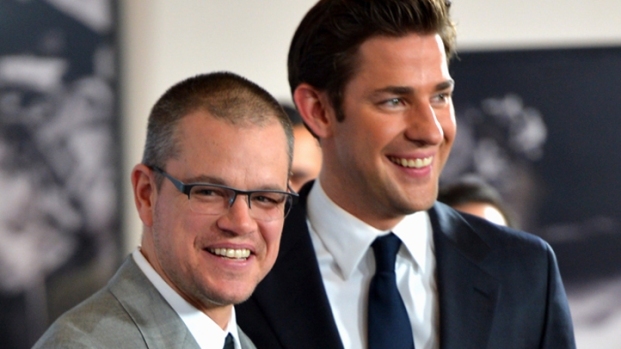 Matt Damon Finds the "Promised Land"
Matt Damon pulls double duty as he stars and shares writing credit with co-star John Krasinski in their new film, "Promised Land." Plus, Matt reveals he's really excited to work with George Clooney in his next project. The really moving part was when we actually went to shoot in the town, they were so generous and so open to have us. But at the same time, people weren't against coming up and telling you how they really felt. And there were people who came up and said, ‘You shouldn't be making this movie. This is really good for us.’ And five minutes later, someone would come up and say, ‘Thank you for making this movie.’ We never expected it to be the movie that deals with this issue. Our whole thing was at the end to start a conversation, and whether it's fracking or something else, it's like these issues are something that have communities getting together and making decisions for themselves… is really the most important thing, especially this day and age. 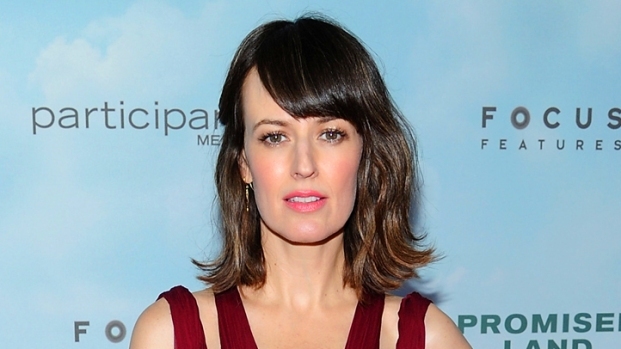 Rosemarie DeWitt says she learned a lot about fracking from her new movie, "Promised Land." She also talks about how dedicated her co-stars and producers Matt Damon and John Krasinski were to the film. I think sometimes the movies just show small town America as the people who just get bowled over by anyone who has an idea and in comes innovation and creators, and they just push these people aside. That's not the truth at all. These people are very dedicated to their opinions and very proud of where they're from. And that was the thing about getting there and first of all seeing how gorgeous it was. I mean it was beautiful…The truth is that you see what these people are fighting for. And when I say what they're fighting for, I don't mean either side of the issue. What I'm saying is that they are fighting for what everybody else is fighting for: their family, their friends, what they are from and where they're going. And it's a self-protective survival mode, and that's what's so admirable about these people really digging in on these issues. And it's happening all over the country. 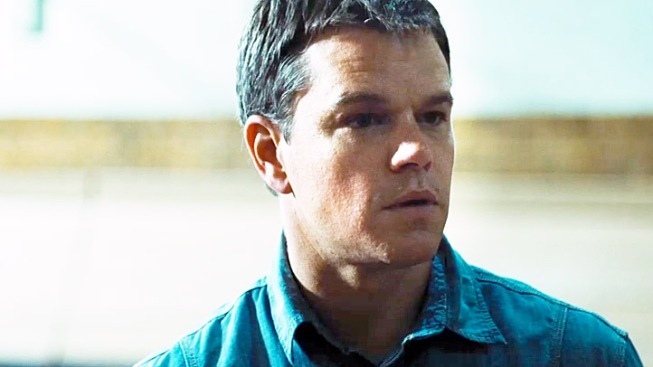 I met Matt when he was doing a movie with my wife [Emily Blunt], ‘The Adjustment Bureau,’ and we became friendly right away – which was really nice because being from Boston, the guy from ‘Good Will Hunting’ is pretty much the mayor of some fictitious town. One day we were on a double date, and he said, ‘I'm actually thinking of directing. Is there anything you that have in the works that you'd be willing to share with me?’ I said ‘Yeah’ and I brought him this idea, and he jumped onto it right away. We were writing within a week or two, and it worked really, really well. He actually was shooting ‘We Bought a Zoo’ in California at the time, and I was shooting my show ‘The Office,’ so we were kind of moonlighting. We worked really well together. We worked really fast. We have similar sensibilities and similar sense of humors, but at the end of the day, I think we're eternal optimists, so we wanted the same thing. We wanted this to be an uplifting kind of Frank Capra, Kazan movie. Where we were headed was always the same, so getting there was a lot quicker. I'm definitely going to cultivate it further. This was an incredible learning experience for me on every level, but I think, if I'm honest, the truth is it's a really big moment for me. This is a transition from the show that I think is meaning more to me than I think anybody knows. I think to have this show end is going to be such an incredibly emotional moment for me. Not only because of the show and the cast and the crew and that family aspect, but it's an era of my life that's going to be gone – and it is my twenties, basically. It's one of the most important decades of my life was spent with this show. And I owe it absolutely everything. No one would know my name if it wasn't for that show, and I wouldn't have any opportunity if it wasn't for this show, to sort of grow up and have that show support me. If someone asks me ‘What would you do if we gave you the keys?’ ‘This is the movie that I'd do if you gave me the keys.’ This is the kind of thing I've always been interested in. These are the characters that I've always been interested in watching or interested in playing, so I really want to do it more. And to have this team surrounding me – to write with Matt and to have Gus on board – it was so surreal and so inspiring, but also probably spoiled me because now I'm just like, ‘All I have to do is write some sort of document, then all of a sudden, Matt Damon and Gus Van Sant will sign on. How hard is this, folks?’ I don't know how the next ones are going to turn out, but also at home my wife was hugely supportive. And I'd always heard that story that the blank, white page is a scary thing. I'm like, ‘Come on – there are bigger things to be scared of.’ Then you sit down, and you realize, like, ‘Wow, that IS pretty scary.’ So she was the one who just kept saying ‘You can do it,’ and ‘Get up there and give it a couple more hours.’ And sure enough, it clicked, and I really, really loved it. So I'm going to give it a shot, and hopefully keep going as long as there's stories that I can tell well. And until then, I'll at least give it a shot.